During my early days of researching the Tesla Model S, I had concerns about a number of things that were emerging in the press. Fires, Model S drive unit issues, and handling in the snow. Tesla quickly addressed the “firegate” issue by retrofitting the Model S with a titanium shield. My concerns around winter driving, in particular handling in the snow, also became a non-issue after watching several winter driving videos put together by Bjørn Nyland. Within no time, I became a new Model S owner and quickly learned that driving in the winter could actually be quite fun with a good set of winter tires. Tesla later introduced the all-wheel drive “D” models putting to rest any remaining doubt that the Model S could be the best and safest handling car in the world. 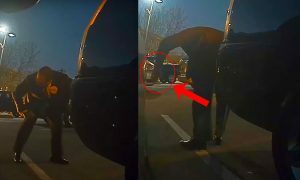 But one question still remains for me, Has Tesla dealt with the Drive Unit issues? There is a group of Model S owners across the forums, but also validated by major publications such as Edmunds, that have had one or more drive unit replacements. Early reports of drive unit issues ranged from total failures that left the Model S inoperable, to more recent complaints of clunking and milling noises. 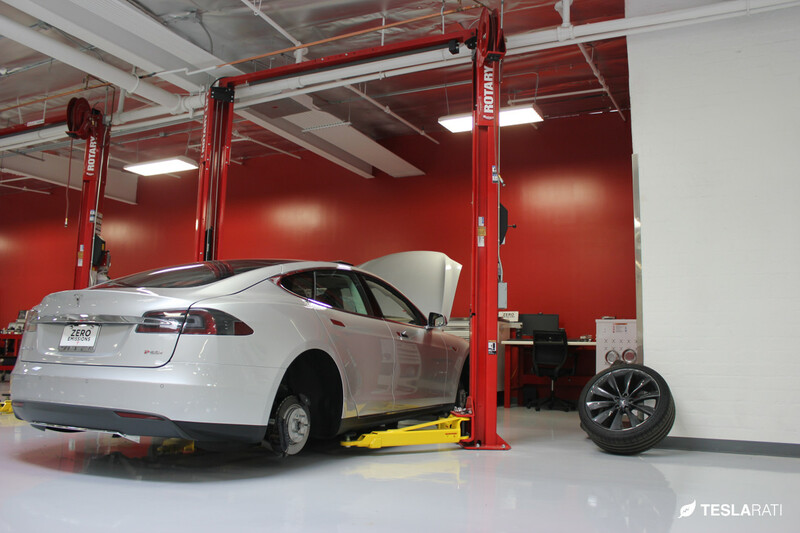 Elon has said in the past that many of these pre-emptive drive unit replacements were unnecessary and a simple $0.50 shim was all that was really needed, yet Tesla Service centers have been proactively replacing drive units. The following polls from TMC show that a majority of Model S owners have had their drive units replaced. While the poll only represents a small sample of Model S owners, one might draw significance in the numbers as the density circles around owners needing a drive unit replacement at relatively low mileage, and without any harsh driving prior to failure. 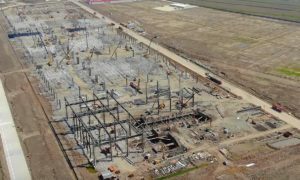 The polls also give insight to the motive behind each drive unit replacement. Though it appears the issues mainly center around earlier versions of the Model S, there’s been reports of newer Model S with Autopilot hardware hearing milling noises coming from the drive unit. One viewer described the sound as “sawing wood”. In typical Tesla fashion, the company acted fast to address the issues, and curb concerns by offering an unlimited mile/8 year warranty on the drive unit. 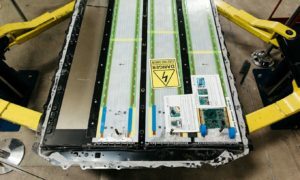 I think this was a great response by Tesla which put to rest any concerns about the quality and long term durability of their drive units. 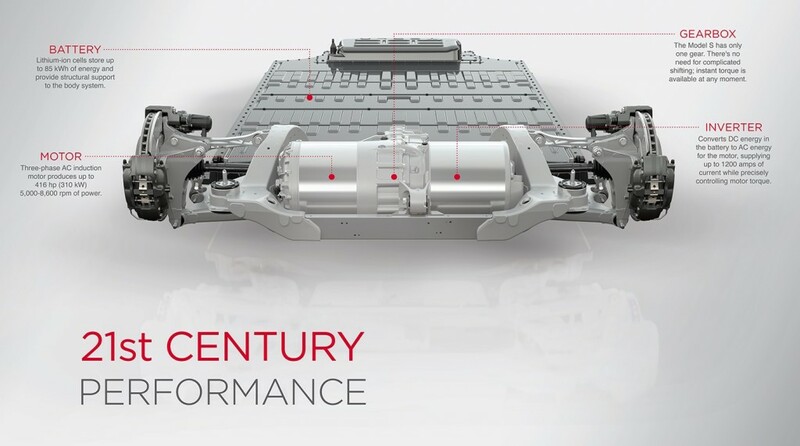 Elon is now talking about building a power train that will last a million miles and I believe Tesla continues to put significant energy into improving the drive units. 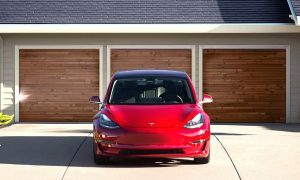 Tesla continues to honor the warranty and is proactively replacing drive units that show early signs of problems. After 12 months of Model S ownership and 30k miles drive, I started hearing a humming noise from the rear of my Model S during highway cruising. The noise was unusual as I had gotten used to hearing only the noise of the tires and wind, but there was a new noise only noticeable when cruising or decelerating with regeneration at 65 MPH and over. 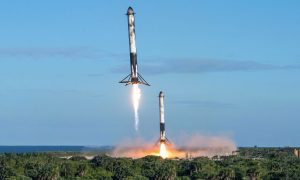 The noise continued to become more audible over the next few months, but I learned to live with it and did not contact Tesla. My personal rule of thumb on noise related issues is to wait for passengers to comment on it first. It’s my self crazy check. Two months after the original drive unit humming noises began, a higher pitched milling type noise started occuring when traveling at speeds of 20 MPH or less. The sound varied depending on how much power was being used. That’s when I reached out to Tesla. Tesla service had me come in for a test drive which they can do on demand without you needing to wait. We drove about a block before the Tesla service technician said the drive unit needed to be replaced. The explanation was that tolerances inside the drive unit have led to metal particles getting into the fluid around the drive unit, and as the concentration of particles increased, it caused the noise from the drive unit to become louder when under load. The new drive units evidently have better tolerances and are less prone to having metal particles being shaved off. At that time, Tesla service has been very backed up here in Massachusetts so my appointment for the drive unit replacement was scheduled six weeks out. I put on another 4,000 miles during that wait time, with an increasingly louder drive unit, before it was finally replaced. When Tesla replaces a drive unit, they replace both the drive unit and inverter as you can see from a copy of the parts list. 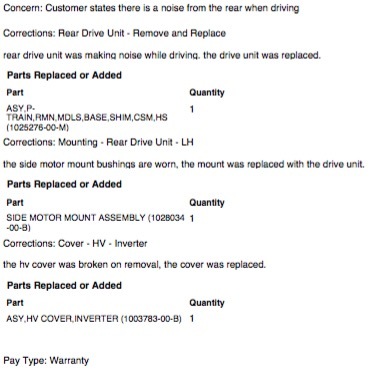 The last letter in the drive unit part number (“M” in my case) seems to indicate the generation of the drive unit. The later the letter the better, with the “Q”s seeming to have the best longevity according to the forums. I’m happy to say that I’ve logged 8,000 miles of happy and noise-free driving after my drive unit replacement. The replacement was done recently so my guess is that I have a newer unit, and thus hope this will be my only replacement. Thankfully for all of us, Tesla has a first class warranty and level of service. While it goes without saying that inconveniences such as this may happen, rest assured that Tesla has you covered and will always strive to make things right. Tesla Model X Limited to 48 Amp On-board Charger, Not 72 Amp?